Jordan Spieth with the Stonehaven Trophy. When the Australian Open started four days ago, there were three players in the field that stood out above the rest: Jordan Spieth, Adam Scott and Rory McIlroy. From the very beginning, it looked like one of them was going to be lifting the Stonehaven Trophy as the victor, but it’s safe to say that no one thought that it was going to end in the way that it did. Spieth’s approach to the sixth. Spieth’s putter, which has been seen as his Achilles heel in the past, was absolutely lights out on Sunday. Side door putt on 5. After Rumford stuck it close, Spieth kept the foot down on 7. Curling one in on 15. Of course he hit this one on 16. The final birdie putt on 18. On Sunday, he was only wayward from the tee on one hole, the par-4 9th. He missed only a couple of greens, and when he did, he was never in a bad enough position that he couldn’t recover. Spieth had several opportunities to close out tournaments on the PGA Tour in 2014 and never got it done, which really isn’t uncommon, especially for a 21-year old, but he was given a label that you would think he just broke with this kind of dominant final round. Sure, the field wasn’t what you would see at say, a major or a WGC event, but the way that he played all week, through difficult conditions and in an area that he had never really seen, was obscenely impressive. Spieth didn’t need to win this week to prove how good he is, but anyone who was unsure should have no further doubts. You know someone is in a good place when we’re disappointed with a T-15 finish. Rory looked great at a lot of points this week, especially in the opening two rounds when he was in good position at 4-under par heading to the weekend. 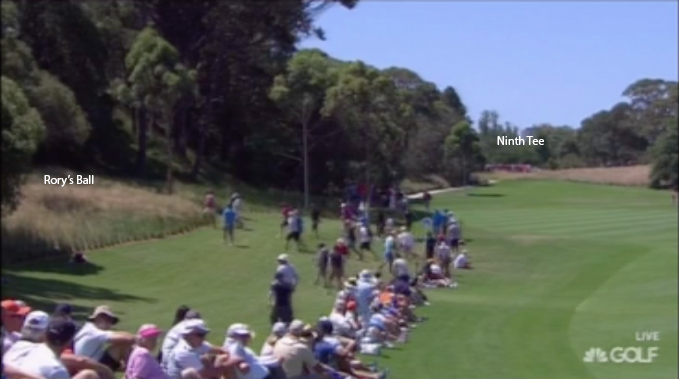 Rory’s approach into the 9th on Thursday. Rory drills a long putt on Friday. He was mostly level par after that for the last 27 holes, but obviously that wasn’t going to be good enough with the way that Spieth was playing. If anything, this should serve as a reminder that even the best players in the world can play like the rest of us from time to time. I mentioned this at a few points on Twitter this weekend, but I’m pretty sure that Adam Scott won’t be affected at all by the anchored putting ban in 2016, mostly because I think he’s the worst putter I’ve ever seen for a world class player. Even when he’s making putts, it seems like he very rarely hits the middle, and in most cases, he’s lipping out or missing completely. Watching Scott play is an absolute treat, but seeing him on the greens is rough. I know it’s plugged Todd, but get those feet set. Todd Sinnott with the club twirl out of the pine straw. It’s not going there, Jordan. Chalmers hits a fan and gets a nice bounce. Li Xinyang uses the contours. Scott Gardiner with the ace. 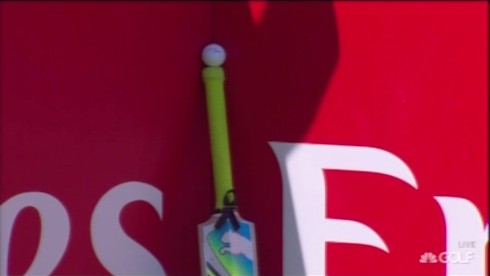 Nice tribute to Aussie cricketer Phillip Hughes on the 63rd hole of the tournament.